After the recent German election, that country may be a step closer to assuming its full status as the greatest power in Europe, and the greatest in the world after the United States and China. It has long been a truism that Germany was very late unified (1871, the latest of all the G-7 countries, even newer than Canada), had great difficulty determining whether it was mainly an eastern- or western-facing country, and, every time it set out to reinforce its own security, it infringed the security of its neighbors. Germany was the greatest power in Europe from the day of its founding, and all previous leading European statesmen since the beginning of the nation-state had realized the desirability for them of avoiding the unification of the German-speaking sections of Europe. Among these were Richelieu, the founder of modern France; Napoleon; and the Austrian chancellor Metternich, the last successful opponent of German unity. From when Bismarck outwitted successively the Austrians and the French, and attached almost all the German-speaking areas to Prussia, except for the present Austria — a few million people in and around Vienna — Germany became a country so formidable in Europe that there were constant assemblies of coalitions and alliances to counterbalance it, especially after the foolish young emperor, Kaiser Wilhelm II, who fired Bismarck, the unifier of Germany, after 28 years as leader, discharged Russia from its alliance with Germany and provoked the British by building a navy of competitive strength to challenge it for the scepter of the seas. First France and Russia became allies, and then France, Russia, and Great Britain (and its immense Empire), and that combination barely overcame Germany in World War I and needed the collaboration of the United States in the last 19 months of that war to prevail. At the end of World War II, every square inch of Germany was occupied by its principal enemies, but under American leadership, the three Western Allied zones of occupation were formed into the Federal Republic of Germany (West Germany) and reconstituted as a serious democracy, for which the Germans devised institutions that have governed well and equitably since 1949. As the United States was the only country that was, because of its own immense might, not afraid of a united Germany, the Americans were Germany's principal helper in escaping the stocks of war-guilt. The Western Allied armies of occupation became, after four years and after a suitable reduction in force levels, the vanguard of the North Atlantic Treaty Organization. To the distress of the French, and with no great enthusiasm from the aged Winston Churchill, President Eisenhower — the former commander of the Western armies of liberation and chief military governor of Germany and founding commander of NATO — welcomed West Germany into NATO in 1955 and, with the great German post-war chancellor, Konrad Adenauer, led the political rehabilitation of Germany. Arguably the greatest single act of statesmanship in the world since World War II, along with the Marshall Plan, was Adenauer's rejection of Stalin's offer of reunification of Germany in exchange for German neutrality. Adenauer believed that Germany had lacked allies in the past that had been of any use to it (Austria-Hungary and Turkey in World War I, and Fascist Italy in World War II, were a burden to Germany) and now she was allied with the United States, Great Britain, and France, and would be reunified eventually with the help of her allies. Adenauer and Charles de Gaulle ended the long antagonism between their countries with the Franco-German Friendship treaty of 1963. The European Common Market had been formed, then the European Union, and the Soviet Union and its dominance of eastern Europe disintegrated, as Germany spontaneously regained its unity and the Western Alliance and European economic union moved past Germany, to the Poland–Ukraine border and along both sides of the Baltic. Germany was in a cocoon of political and economic allies, as generally convivial a country politically as it had at times been belligerent and oppressive. By being the cooperative and even diffident engine room of European unity, Germany has benignly achieved most of the general preeminence it had sought in Europe under Bismarck and, in his deranged way, Hitler, but with an unwavering aversion to the use of force. It has been an astounding saga, enabled and guided by the United States in one of America's greatest triumphs of sustained statesmanship, and many American leaders, including General Marshall, President Truman, Dean Acheson, Presidents Eisenhower, Kennedy, Nixon, Reagan, and George H. W. Bush, and Secretaries Kissinger (a German native), Shultz, and Baker, have all had a hand in it. Since 1949, the Christian Democrats and their Bavarian associated party have governed Germany for 48 of 68 years, always reliably attached to the Western Alliance. The Social Democratic chancellors — Willy Brandt, Helmut Schmidt, and Gerhard Schroeder — were a mixed bag in alliance terms, Brandt being especially susceptible to the forest murmurs of courtship from the east, but all held their party, which has always been fundamentally divided on the issue of looking to the east or the west, solidly enough in the Western Alliance. But at this point, it is force of habit. For most of its history, West Germany had no great difficulty deciding whether it liked better America's soft and protective hegemony or the hobnailed jackboot of Marxist and economically bankrupt Soviet Communism. It was in 1953 that puppet East German leader Water Ulbricht said, after pro-democracy demonstrations in East Berlin, that the regime had "lost confidence in the people" (and former Communist Berthold Brecht asked whether Ulbricht wished "to dissolve the people and elect another"). As of this week, the Christian Democrats are down to 34 percent, and the stranglehold on Bavaria has been loosened. The Social Democrats have crumbled to 20 percent, and the conservative and somewhat nationalist, anti-immigration, and Euroskeptical German Alternative party has arisen with 13 percent. The capitalistic, small-business Free Democrats have come back up to 10 percent, just ahead of the Linke (the detritus of East German Communism) and the Greens. Ideologically the country has moved to the right, and the Center-Right and Right outnumber the Left 60 percent to 40 percent among the voters. There are practically no real extremists, though a few old leftists fester in the Linke. 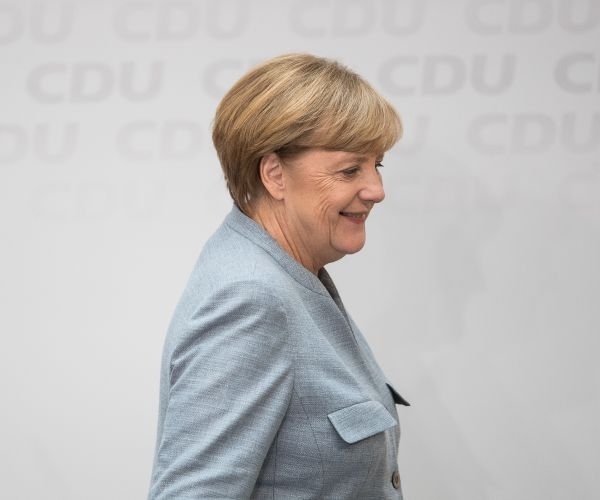 But there is also a fragmentation of parties and Merkel will have to organize a three-party coalition, or govern with a minority and assemble parliamentary majorities to legislate on each initiative, picking up either Alternative or Green votes to get her measures passed (the Free Democrats are reliable supporters). Unscripted and scarcely discernible from the outside is a gentle tussle for the heart and mind of the world's third most powerful country. Until relatively recently, Germany would not deploy forces outside the NATO area without the approval of the United Nations. There is increasing antagonism within Europe to the anti-democratic authoritarian regulators in Brussels, who do not answer to the European Parliament or to the major leaders of the component countries, and are elected by the unelected commission and not even answerable to it. Any change of geopolitical movement by Germany could be immensely important. Merkel could have been Bismarck-in-drag if she had been minded to lead from the front, but she has been a reliable and sensible centrist leader, moving subtly, apart from her impetuous admission of a million desperate migrants. It is hazardous to mind-read, but the fact that she did admit them and survived politically indicates the depth of continuing German guilt for the atrocities of the Nazis and the legacy of Prussian-German militarism generally. Nothing dramatic is afoot, but Germany should have at least as great a voice in the world as its ancient rivals, France and Russia, and that voice, if raised a little, should be one that America would welcome. But Germany has not fulfilled its natural role as Europe's greatest power in Europe in a responsible way since the rustication of Bismarck 127 years ago. Putin is too disreputable and autocratic and Russia too feeble, suspect, and distant; and France's Macron is still an unknown quantity. Britain is edging back to a mid-Atlantic offshore posture. In February, Merkel will pass Hitler as Germany's fourth longest serving chancellor (after Bismarck, Helmut Kohl, and Adenauer); there is no obvious successor and no party but hers capable of forming a government. Europe and the world are waiting for the sensible and benign Germany that has led Europe to economic success, under the American umbrella and then in a voluntary concert of Europe, to show its hand and fill the vacuum of European leadership. Germany has an opportunity unique in its history and reserved to few countries to influence the world.